From Metallica lead quitarist Kirk Von Hammett's personal line of horror collectibles! 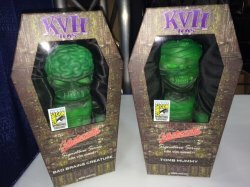 KVH Toys presents the Tomb Mummy and Bad Brains Creature in their separate coffins. These are rare 2015 San Diego Comic-Con SDCC Exclusives. 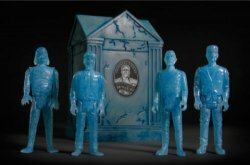 You get two Collectormates Signature Series 8 1/4 inch figures from Kirk Von Hammett, packaged in individual coffin boxes with silk padding inside to make the creatures more comfortable. These were made available exclusively for the 2015 San Diego Comic-Con International show. Includes sticker denoting this. Collectors Note: These collectible, window-boxed figures were not sold in shrinkwrap and are recommended for ages 15+.